Do you need a last-minute frugal Easter gift? 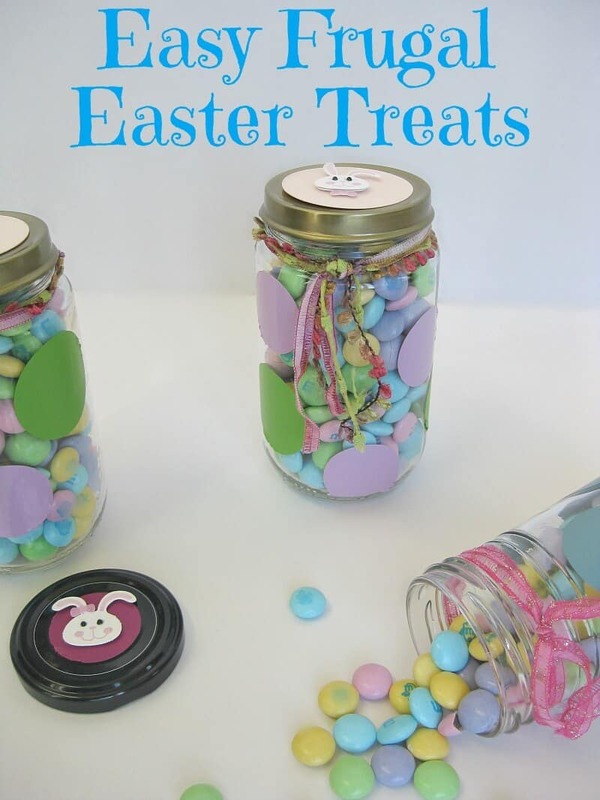 Do you need a quick and easy DIY Easter gift? 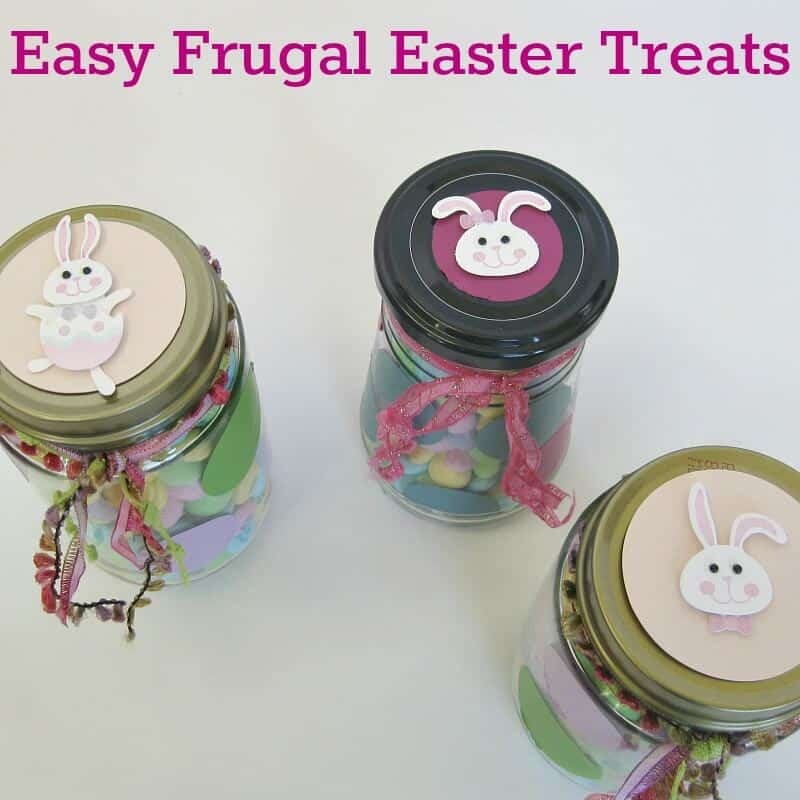 I’ve got the perfect easy frugal Easter treat for you. You can make these adorable little gifts in minutes and for pennies each. I used craft supplies that I already had and recycled jars so the only cost that I had was the candy I used to fill the jars. 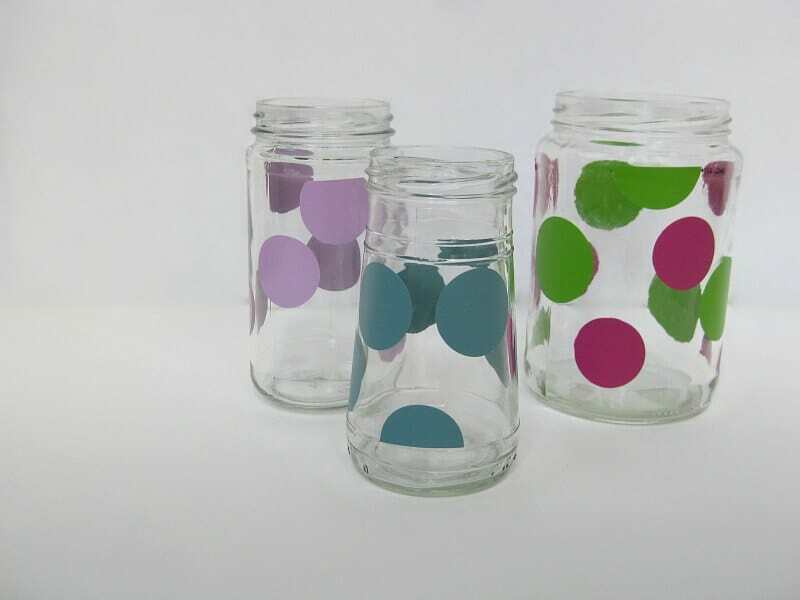 Grab a couple of recycled jars from your glass jar stash. What? You don’t have a glass jar stash? You could pick some jars up at the dollar store or thrift store or ask a friend who has a glass jar stash of their own (ahem, like me). 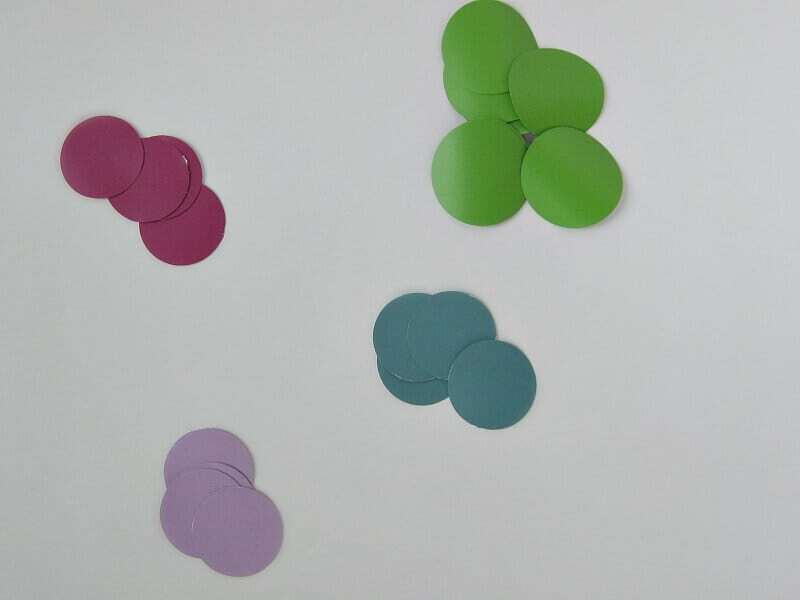 You could use circle stickers or do what I did and use a circle punch and some leftover vinyl scraps to make your own circle stickers for free. Choose spring-y colors or use colors to go with your decor. 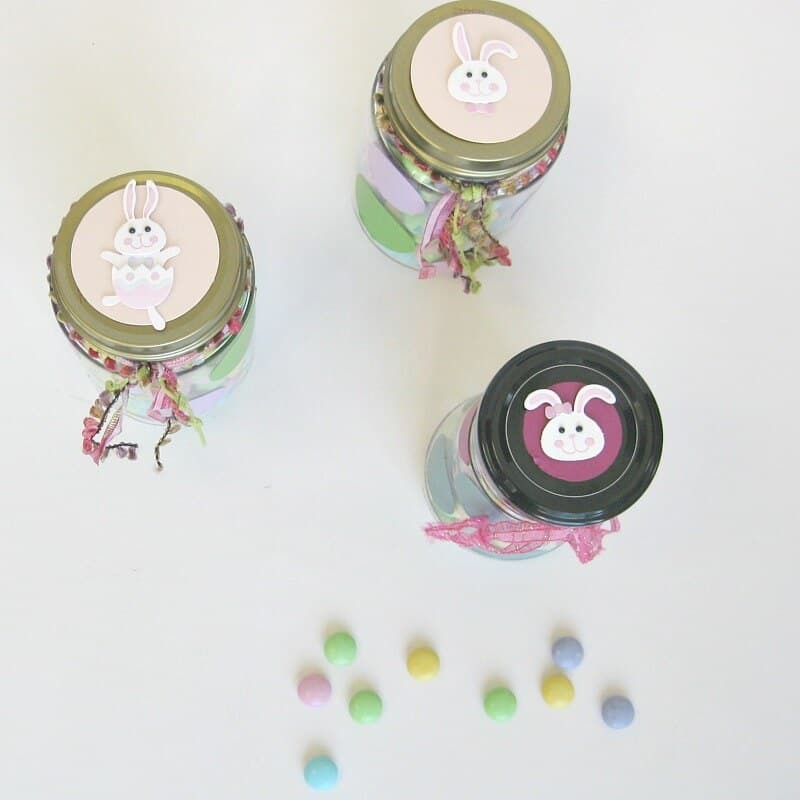 Add a bunny sticker to the lid of the jar. 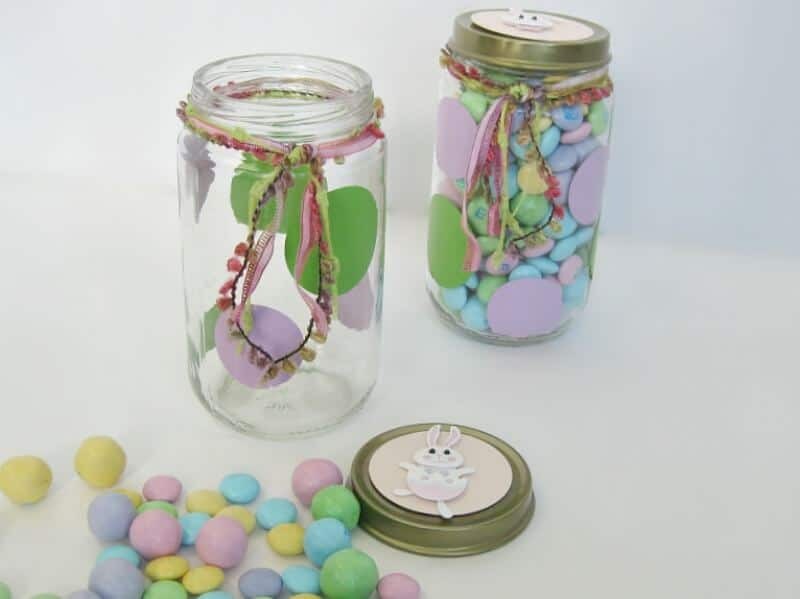 Embellish the jar with ribbon if you like. 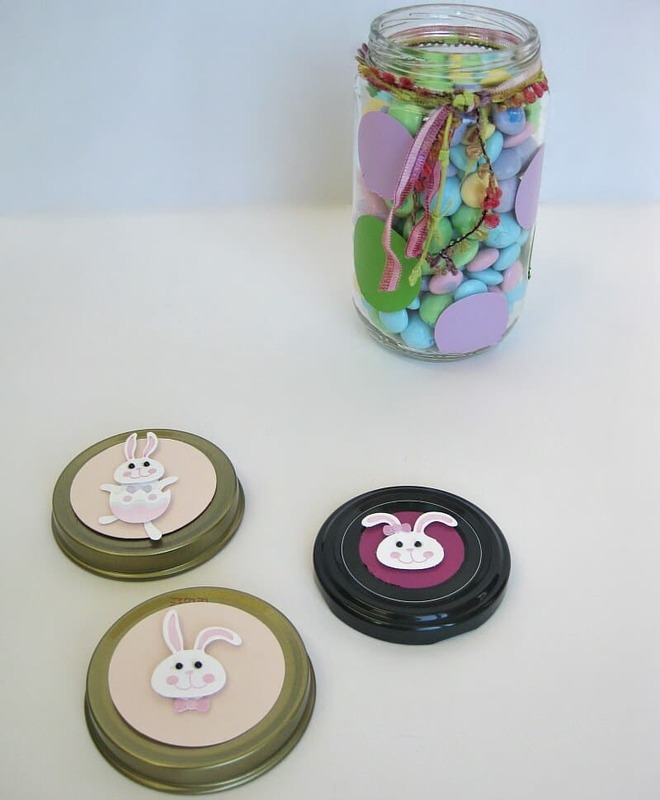 And then the most important step – fill your jar with Easter candy. Truly, it took less than 10 minutes to make these 3 jars. Truly. 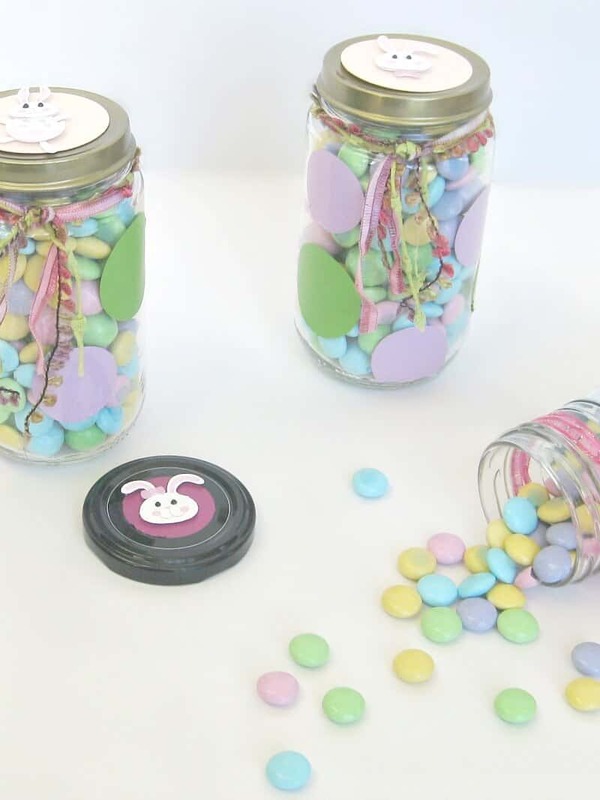 These easy and frugal Easter treats would make great party favors. They’re also a fun craft to make with children of all ages. Whether it’s weeks or hours until Easter, you have time to make these easy frugal Easter treats. Who do you know who would enjoy one? These are soooooooooooo CUTE !! We don’t celebrate Easter, but I could have my nieces making them during the summer. We love animals, so why not using bunnies? We always need some special gifts, or last minute details, for friends, family and kids. I like to keep extra small gifts on-hand for unexpected guests. Happy gifting, Miriam. These are super cute! I think these would be a great gift (and inexpensive) for my daughter’s teachers. Adding them to my grocery list! Thanks, Andrae. I’m sure your daughter’s teachers will appreciate them. How thoughtful to give them Easter gifts. Me too, have jars, as I like to make sweets, and mermelades,and chutneys, all my friends, bring their empty jars. So glad that I’m not the only with friends that bring you empty jars (which I could easily call “their trash”), Miriam. 🙂 But it makes me so happy to repurose items. Hi Susan, another super cute project. You are so creative. I have to dig my craft supplies out of storage. Thanks, Kathy. They were quick to make and I was pleased with how they turned out. This is my kind of DIY gift–quick, easy, and inexpensive! Better yet, it’s something I’m sure most anyone would love to receive. I love this idea! I have the perfect jars that I keep saving for something… now I know what. I found your through Linky Palooza on I Heart Naptime. Thanks, Kati. Have fun using up some of your jar stash. These are a cute idea! I don’t have any glass jars, but I do have plenty of scraps from when I used to do scrapbooking, including stickers. That would be a cute gift to send home with your Easter dinner guests. If we were neighbors, you could raid my stash of glass jars, Brenda! 🙂 I have a bit of a “pretty” recycled jar hoarding issue. Best regards and happy easter. So happy to be able to help you celebrate the happiest of the holidays, Miriam. I’ve been thinking about Venezuelans for months, with everything going on there. Take care and stay strong. This is a very cute idea! I’m sure your guests would love to go home with one of these after Easter dinner. It would also be a cute idea to give to a neighbor.